The Holy Bible commands us to remember those who went before us preaching the word of God: Remember your leaders, those who spoke the word of God to you; consider the outcome of their way of life, and imitate their faith. (Hebrews 13:7) They are to be our examples and models of faith, piety, and devotion to Jesus Christ our Lord and Savior. One such recent example of faith lived and struggled for the Faith in the mountains and villages of many of our ancestors. Our Holy Father Alexis Kabaluk was born with the name Alexander in 1877 in the Rusyn village of Yasinie to a pious Greek Catholic family. As a youth he was drawn to God and frequently visited Orthodox and Greek Catholic monasteries. After completing his military service he visited the Monastery of Biskad, now in Romania, to seek the counsel of the Elder Arcadius who blessed him to become a monk. Unable to accept the false union with Rome, Alexander entered the Orthodox Church in 1908 while on pilgrimage to the Holy Mountain – Mount Athos in Greece. In 1910 he was tonsured a monk at the Yablochino Monastery (now in Poland), taking the name – Alexis, and he was ordained to the priesthood later that year. At this time there was a growing movement away from the Greek Catholic church, which had been forced upon the Carpatho-Rusyn people by the Hungarian authorities, to their ancestral Orthodox Faith. This movement was centered in the village of Iza where the villagers were beaten, (and in the case of a peasant, Joachim Vakarov, beaten to death) imprisoned and fined because of their attempts to profess the Orthodox Faith. It was to this village of Iza that Father Alexis arrived secretly, hidden in a hay cart, as the first Orthodox priest. Despite the danger, Father Alexis supported himself working as a wood-turner while he traveled to all the nearby villages preaching and celebrating the Holy Mysteries. Within two years, Father Alexis had established 28 parishes and over 14,000 people had returned to the Orthodox Faith. In response, the Hungarian authorities arrested Father Alexis several times – homes were searched, prayer books, icons, and religious literature were seized. Orthodox believers were hung up on trees so that their feet did not touch the ground until blood flowed from their noses, mouths, and ears. Father Alexis was hunted from village to village, finally leaving in 1913 to continue his ministry among the Carpatho-Rusyn immigrants in America. With dozens of his flock being brought to trial in July, 1913, Father Alexis, now 36, returned from America to suffer with his people. He was sentenced to four-and-a-half years imprisonment and fined. When Tsar Nicholas II heard of the priest’s sufferings, he awarded him a gold pectoral cross for his confession of the Faith. With the end of World War I, the persecution against the Orthodox eased. Upon his release from prison, Father Alexis returned to Iza and lived in the Monastery of St. Nicholas which he had founded. On the Feast of the Transfiguration 1921, Father Alexis opened the Council of the Carpatho-Russian Orthodox Church with over 400 delegates in attendance. 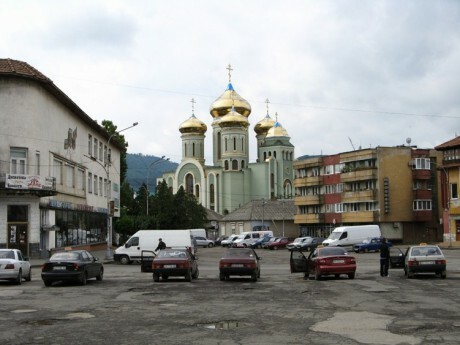 The new Carpatho-Russian Orthodox Church was under the jurisdiction of Bishop Dositheus of the Serbian Church who himself died as a martyrs for the Faith and was glorified as a Saint in 1998. (Read Life of St. Dositheus). The fledgling Church was aided by numerous illustrious Orthodox hierarchs and priests including Metropolitan Anthony Khrapovitsky, St. John Maximovitch (later of San Francisco), St. Justin Popovich, and St. Gorazd the New Martyr. The Diocese blossomed and by 1936 the Mukachevo-Presov Diocese had 127 churches, 138 priests and 140,000 faithful. With the end of World War II, Carpatho-Rus was freed from Nazism but was soon to fall under another yoke – the Communists. Just as they had acted in Russia after the 1917 Revolution, the Communists began the systematic closing of Orthodox and Greek Catholic Churches and monasteries throughout the Carpathians. The Soviet persecution of Carpatho-Rus was another tragedy in the life of Father Alexis as he witnessed the slow disintegration of his life-long ministry. After taking the monastic rank of the Great Schema on November 22, 1947 he fell asleep in the Lord on December 2, 1947. In February 1999, at St. Nicholas Monastery in Iza, Bishop Agapit of Chust uncovered the relics of Father Alexis which were found to be almost completely incorrupt. With the relics was recovered an icon of the Iveron Mother of God which Father Alexis and brought with him from Mount Athos. The canonization of Father Alexis as “The Apostle of Carpatho-Russia” took place in Iza on October 21, 2001, celebrated by His Beatitude Metropolitan Vladimir of Kiev and all Ukraine, attended by over 20,000 faithful. The life and ministry of St. Alexis of Chust is an embarrassment to many modern Christians, both Orthodox and non-Orthodox. The days of suspicion, hatred, fighting, insults, and persecution between Orthodox and Greek Catholics are, thankfully, distant memories. There is a new spirit of peace, friendship and conciliation between these people who are divided by faith yet share the same homeland, language, and customs. To many, the honoring of saints such as St. Alexis merely dredges up a past that is better left to the dust bin of history. Yet the witness of St. Alexis reminds us of an unchanging truth: the Orthodox Church continues to teach that She maintains the Faith of the Apostles “once for all delivered to the saints” (Jude 3). Despite our respect and esteem for our Catholic brothers and sisters, we hold that the Orthodox Church alone has kept unchanged the Faith handed down from the Apostles without additions or subtractions. Thousands of converts are finding their way to the doors of our Orthodox Churches because they too have come to believe that Orthodoxy holds the fullness of Christianity. It is our duty to respect and honor the memory of those men and women who by their sufferings, sacrifices and struggles preserved and taught this unchanging Faith. You shone forth like gold refined in the crucible of this world. For you intercede for the salvation of your people and Orthodox everywhere.